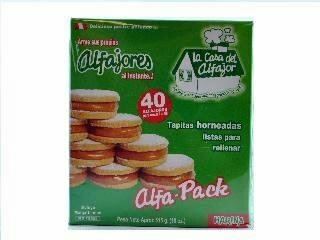 La Casa del Alfajor Alfa-Pack comes with all the ingredients need to make 20 alfajor cookies. This kit contains 40 cookies, a manjarblanco filling, and powdered sugar, all individually packed, so you can make your very own Peruvian alfajores. Everything needed to make 20 alfajores, includes cookies, manjarblanco filling and powdered sugar. Kids will love making the alfajores almost as much as eating them. If you have any questions about this product by La Casa Del Alfajor, contact us by completing and submitting the form below. If you are looking for a specif part number, please include it with your message.